Ghana’s Central Region is rich in natural resources. A substantial, untouched rainforest is part of Kakum National Park, where various types of birds, butterflies, and animals live. Most of the region’s terrain is covered by evergreen forest, though the savanna grassland is increasing in area. The region’s splendid palm-fringed beaches are quite popular with surfers. Historic castles and forts dot the landscape. Elmina Castle, Fort St. Jago and Cape Coast Castle played a grisly role in the country’s history, their dungeons serving as holding cells for millions of people before they were brought overseas into slavery from 1700 to 1807. The region has a predominantly rural character, though its urban population is steadily increasing. Cape Coast, Awutu-Efutu-Senya and Agona are the most urbanized districts. Some of the region’s well-known historic towns are Winneba and Kromantsej Abanze. Duakwa, Mensa Krom, and Ajumako are known for their woodcarving. The historic city of Cape Coast is the capital of the Central Region. It was the seat of British colonial administration in the 19th century. 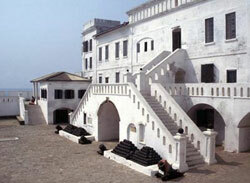 The city was established in the 1600s by the Portuguese, who built the city around Cape Coast Castle. The restored stone castle, once a prison for slaves, now houses an excellent museum of local history and is a UNESCO World Heritage site. Other historic structures in the city include Fort William, which was built in 1820 and served as a lighthouse for over a century, and Fort Victoria, which was constructed a century earlier. The University of Cape Coast, which stands on a hilltop with a view of the Atlantic Ocean, is the leading university in Ghana.